If you love old-time fiddle and mountain music, you're in for a treat. Art Stamper played and taught the Appalachian fiddle style he learned from his father, Hiram, and that Hiram learned from old-time fiddlers who learned their tunes years earlier. Art also played bluegrass fiddle with some of the greatest names in bluegrass, like Ralph and Carter Stanley, Bill Monroe, Larry Sparks, the Goins Brothers, Jim and Jesse. Whether playing Appalachian fiddle or bluegrass fiddle, Art was a musical marvel. 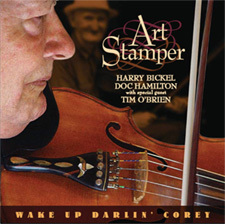 There are many great fiddlers, but only one Art Stamper. Listen for yourself and see. 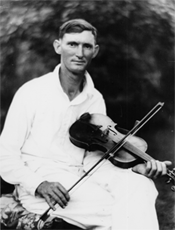 This site has a collection of biographical information, a photo album, a partial discography of Art's bluegrass and old-time fiddle recordings. You'll also find Art's CDs, including some fine fiddle MP3 samples you can listen to while you are ordering online. Art's son Blake is also a great musical talent and is pushing country back toward's it's honky-tonk roots with his own "hickabilly" music. Learn about Blake at www.blakestamper.com. If you'd like to share longer stories or photos, please contact Webmaster Ed Gregory. The event will be held at the 70-plus acre Daniel Boone Jaycee’s Farm just east of Morehead. The weekend event features the Art Stamper Fiddle Contest to honor the legacy of the late Kentucky fiddler. The Knott County native is a member of the Bluegrass Hall of Fame and performed with the Stanley Brothers and Bill Monroe's Blue Grass Boys, among others. "I was fortunate enough to be passing through town on one of the days these guys were in the studio. I enjoyed just sitting on the floor, closing my eyes and listening." 14 great old-time tunes, including classics learned from Art's father, Hiram Stamper, and some great vocals by Tim O'Brien. Featuring Harry Bickel on banjo and Doc Hamilton on guitar. Nominated for 2005 IBMA Instrumental Album of the Year. Memorial T-Shirts - Help keep his memory and music alive. Wear it when you play or listen to fiddle music.